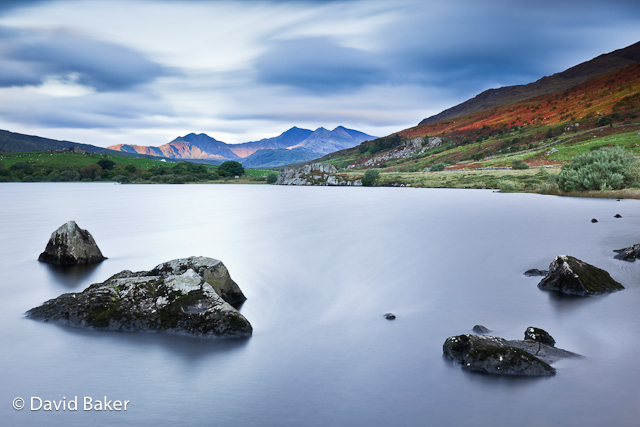 I grew up on the North Wales coast and a short journey to the Snowdonia National Park. My father was and still is a keen mountaineer, so whilst most of my mates spent their weekends hanging around the arcades on the promenade I was usually found walking up a mountain or two in Snowdonia. I was dragged up those mountains in all weather, sometimes it was hot and sunny but driving rain, snow and gale force winds were no reason to stay indoors. They are some of my fondest childhood memories. So this morning I found myself perched on a rock on the edge of Llynnau Mymbyr, Capel Curig with a view across to Mount Snowdon. I can’t believe that its taken me so long to shoot this part of the UK, its an area that I intend exploring a lot in the future. ~ by David Baker on 25 September, 2010.